Maybe one of the coolest country Christmas collections we've ever heard – but then again, we'd expect no less from the folks at Bear Family! There's a lot of great original tunes here – which are mixed with country-fied takes on more popular Holiday songs from the midcentury years – often served up here by singers that were the bigger names of their generation, caught in a very special setting for the month of December! 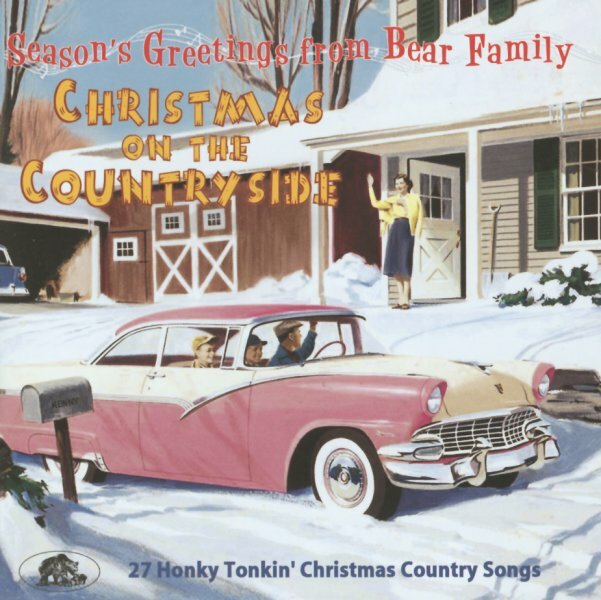 As usual with Bear Family, the presentation is great – vivid images inside and out – and notes on every single track – supporting a selection of 27 titles that include "I'll Be Walking The Floor This Christmas" by Ernest Tubb, "Senor Santa Claus" by Jim Reeves, "Christmas Dinner" by Tennessee Ernie Ford, "Snowdeer" by Carl Smith, "They Shined Up Rudolph's Nose" by Johnny Horton, "Santa Claus Jr" by Eddi Cletro, "It's Christmas Every Day In Alaska" by Hank Thompson, "It Was Jesus (undubbed)" by Johnny Cash, "Reindeer Boogie" by Hank Snow, "The Christmas Boogie" by Davis Sisters, "I'm Your Private Santa Claus" by Eddie Arnold, "I'm Gonna Tell Santa Claus On You" by Faron Young, "Captain Santa Claus" by Bobby Helms, "Santa's Big Parade" by The Louvin Brothers, and "Christmas In My Hometown" by Sonny James. © 1996-2019, Dusty Groove, Inc.